4 Bedroom Semi Detached House For Sale in Yeovil for Asking Price £235,000. This property's price has dropped from £245,000 to Asking Price £235,000. 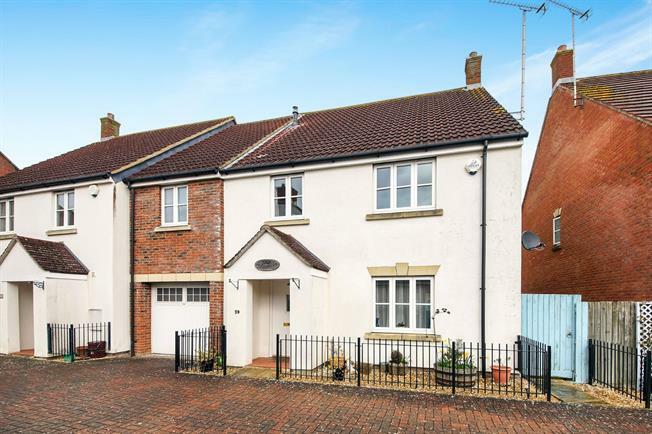 Palmer Snell are pleased to welcome to the market this spacious family home situated within a popular development on the outskirts of Yeovil. The property offers well proportioned accommodation comprising: Kitchen, Utility, Lounge, Dining Room and WC to the ground floor, alongside four Bedrooms (with the master benefitting from an en-suite) and a Bathroom. To the rear there is an enclosed garden and a single garage to the front of the property. With close coupled suite, hand basin with tiled splash back, radiator and extractor fan. With tiled floor, work top and plumbing for washing machine. With radiator, power points, double built in wardrobe, coved ceiling and double glazed window to the front. Tiled and including shower cubicle with glass door, thermostatic shower room, pedestal wash basin with strip light/shaver point over, close coupled WC, chrome towel rail/radiator, coved ceiling and double glazed window to the side. With double radiator, power points, coved ceiling and double glazed window to the rear. Max with radiator, power points, built in over stairs cupboard housing gas fired boiler and double glazed window to the front. With radiator, power points, coved ceiling and double glazed window to the rear. Having a white suite comprising a panel bath with mixer tap/shower head and folding shower screen, tiled surround, pedestal wash basin with strip/ light/shaver point over, close coupled WC, towel rail/radiator, down lights and coved ceiling.